Sometimes Matt and I spend hours making a fancy new recipe that seems like it will surely be “blog-worthy.” As we cook I painstakingly photograph each step and Matt waits patiently while I snap shot after shot of the finished dish before we eat. But guess what? Those elaborate, complicated meals don’t always live up to the hype. Sure, the food tastes good, but it’s just not special enough to warrant the time and energy to sort and edit all of those photos, especially if we know that we’d want to significantly tweak the recipe before ever attempting it again. Other times a delicious recipe catches us totally by surprise. That was the case tonight when I spontaneously decided to combine Cannellini beans, kale and andouille sausage on a pizza. Matt isn’t a huge fan of white beans (or my tendency to try to work them into every meal possible), so he was rather suspicious about the whole idea from the start. I was more optimistic but still didn’t even bother to get my real camera out as I cooked… you’ll have to forgive the iPhone photos but after tasting it we both realized that this pizza was too good not to share! Hidden underneath those layers of spicy andouille sausage, melted mozzarella and wilted kale lies the secret ingredient of this pizza: a garlicky white bean puree. I whipped up the puree using canned beans, minced garlic and a bit of thyme from my garden, then spread it like pizza sauce all over the uncooked dough. The beans imparted a thicker texture and heartiness to each bite of the finished pizza and complemented the bolder flavors of the kale and andouille perfectly. Preheat oven to 490°F. Position the rack 6-8 inches from the top of the oven and place the pizza stone on the rack to warm up. Warm olive oil in a nonstick skillet over medium-high heat, then add in the rinsed Cannellini beans. Saute beans for 2-3 minutes, stirring occasionally. Gently stir in garlic and thyme and continue to cook for another 2-3 minutes until garlic is very fragrant. Lightly salt, then transfer the bean mixture to a food processor. Blend until smooth, adding a little more olive oil if the mixture is too thick. Set aside. Heap the kale leaves in the nonstick skillet you used for the beans. Saute the kale over medium-high heat until the kale is wilted. Sprinkle cornmeal on the pizza peel then drop the pizza dough ball onto the cornmeal. Knead and spread the dough ball into a 15-17 inch pizza. Carefully remove the hot pizza stone from the oven and place it on a heat resistant surface. Transfer the dough to the stone and shape it into a nice circle the size of the stone. Working quickly, spoon and spread the white bean puree onto the dough. Next, sprinkle a few handfuls of the shredded cheese over the pizza. Distribute the wilted kale evenly over the pie, leaving a 3/4 inch “margin” for the crust. Sprinkle the remaining cheese over the kale and layer the andouille sausage slices over the cheese. Carefully slide the pizza stone back into the hot oven. Bake the pizza for 8-9 minutes, or until the cheese is bubbly and the edges of the crust are starting to turn golden brown. 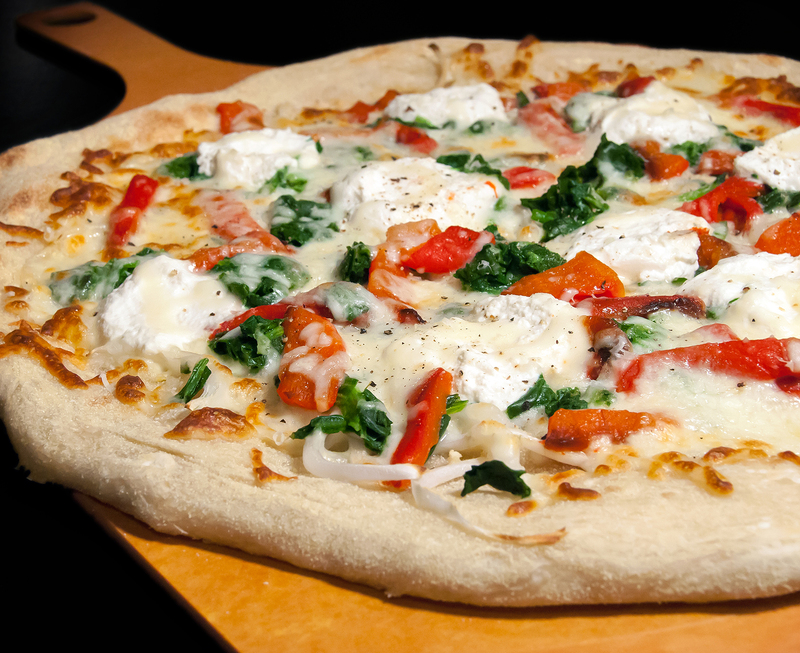 Keep an eye on the pizza as it cooks… if your oven heats unevenly (like ours does!) rotate the pie with a few minutes left on the cook time. Remove the pizza from the oven, slice and enjoy! I love pizza and I LOVE nachos so tonight I decided to combine these two culinary delights into one delicious meal: Mexican Pizza! I made up the recipe as I went along and, after sinking his teeth into the first sausage-y, cheesy, tomato-y bite, Matt declared that this pizza was my best-ever made up recipe of all time! The ingredients are simple: pizza dough, cheese, and your favorite nacho or taco toppings. I used fire-roasted corn, beans, red onions, green onions, jalapeños (from our garden), cherry tomatoes (also from the garden! ), and sausage that was crumbled and cooked with a bit of taco seasoning. The sausage that we had on hand was actually bratwurst which obviously isn’t the most Mexican of sausages but it ended up tasting just fine. If I was going to plan for making this again I’d try some nice fresh chorizo sausage instead. Yum! Annie’s Mexican Pizza – a The Little GSP original! Heat a skillet (I used my wok) over medium high heat and add the frozen corn. Allow the corn to thaw and then dry roast in the pan for approx. 10 minutes, stirring occasionally, until the corn is starting to blacken slightly. Transfer the roasted corn to a bowl and set aside. Put the sliced jalapeños into the hot skillet and roast for 10 minutes, stirring occasionally, until the pepper slices start to soften. Transfer the jalapeños to a bowl and set aside. Add the crumbled sausage to the hot skillet and spread it out in one layer on the bottom of the pan. Allow to brown for 2-3 minutes, then stir the sausage frequently until browned and fully cooked. If using a mild sausage (or if you want an extra kick), stir in the taco seasoning. Transfer the cooked sausage to a paper towel-lined plate and set aside. Now here’s the fun part… building your Mexican pizza! I started with a sparse sprinkling of red onion followed by a bit of Mozzarella, a scattering of black beans and a generous helping of roasted corn. Then I added a thin, even layer of Mozzarella over the whole pizza before spreading all of the crumbled sausage onto the pie. After a final sprinkling of Mozzarella I added on the cherry tomatoes, jalapeños, and a few more bits of red onion. Finally, I topped off the pizza with a little shredded Mexican Cheese Blend to give it some nice color. Bake your Mexican Pizza in the 500°F oven for 10-12 minutes or until the crust is puffed and fully cooked. If using a pizza stone, you’ll have to transfer the uncooked pizza from the pizza peel onto the hot stone in the oven (a skill that we’re still working on!) and then slide the fully cooked pizza back on the peel to be cut. Sprinkle the chopped green onion over the top of the pizza, slice the pizza, and serve with hot sauce and sour cream. Enjoy! 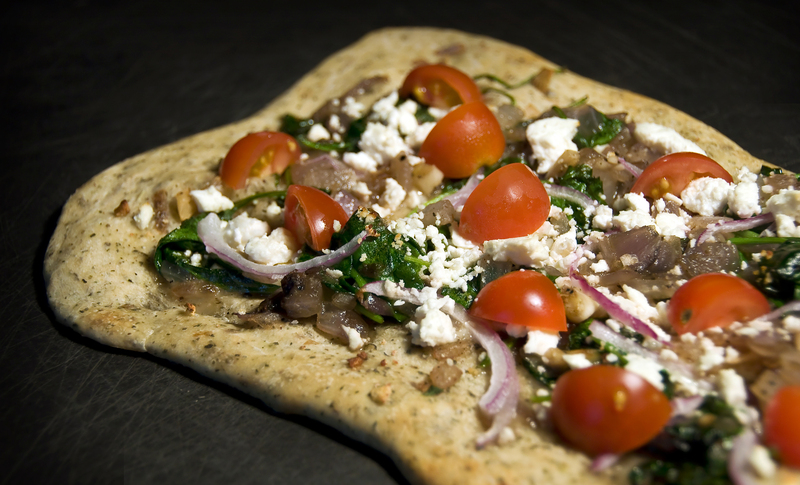 Crumbled Sausage, Spinach and Ricotta Cheese… yes! When Matt suggested that we try these toppings on our latest batch of Trader Joe’s pizza crust I enthusiastically agreed and, after enjoying the end result last night, I don’t know why we never tried this delicious combination before! For Christmas Matt gave me My Pizza by Jim Lahey and, although I haven’t actually made any of the recipes yet (I’m holding out for a pizza stone and peel first! ), the cooking method that we used for this recipe was definitely inspired by the book. I usually cook pizza at 425°F but, after reading Jim Lahey’s chapter on cooking dough, we decided to try something radically different and instead broiled the pizzas in a preheated 500°F oven. The resulting pies had a whole new level of caramelization and wonderful crispiness that I’ve never before experienced in a home-cooked pizza. Yum! Preheat your oven to 500°F. Remove the sausage from the casings and press into the bottom of a preheated skillet over medium-high heat. Allow it to cook undisturbed for 2-3 minutes and then use a metal spatula to stir the sausage and separate it into crumbled bits. When the sausage is completely cooked through (and, ideally, getting a little crispy on the edges! ), transfer to a paper towel lined plate and set aside. Return the skillet to the stove over medium heat and, if needed, add about a tablespoon of olive oil (there might already be enough fat in the skillet from the sausages). Add the minced garlic and allow it to cook in the oil until it is fragrant and just turning golden brown. Reduce heat to medium-low and add the spinach. Use tongs to toss and stir the spinach until it is wilted then remove from heat. On a flour-dusted surface, halve the pizza dough and stretch each piece into a generous individual-sized pie. (Mine usually each end up being about 6” by 10” which fits well on my rectangular pan.) Place the crusts on a non-stick or lightly oiled pan (or use a pizza stone, if you have one!). White Pizza broiling in the oven. Spread about half of the ricotta cheese onto the two pizza crusts with the back of a spoon, leaving a 1” margin around the edges. Sprinkle on some chopped onions if you want (Matt didn’t want any but I tried them and they were great!) and top with the shredded Mozzarella. Next, evenly distribute the cooked sausage over the pizzas and add the wilted spinach and garlic. Drop the remaining ricotta onto the pizza in spoonfuls and finish off the pizzas with freshly grated Parmesan. Just before putting the pizzas in the preheated oven, switch the oven to “Broil” and cook the pizzas on the top rack for approximately 10 minutes. Check on the pizzas frequently (it’s OK to open the door) to make sure that they are not burning. The pizzas are done when the cheese is turning golden brown and the crust is just starting to brown on the edges. 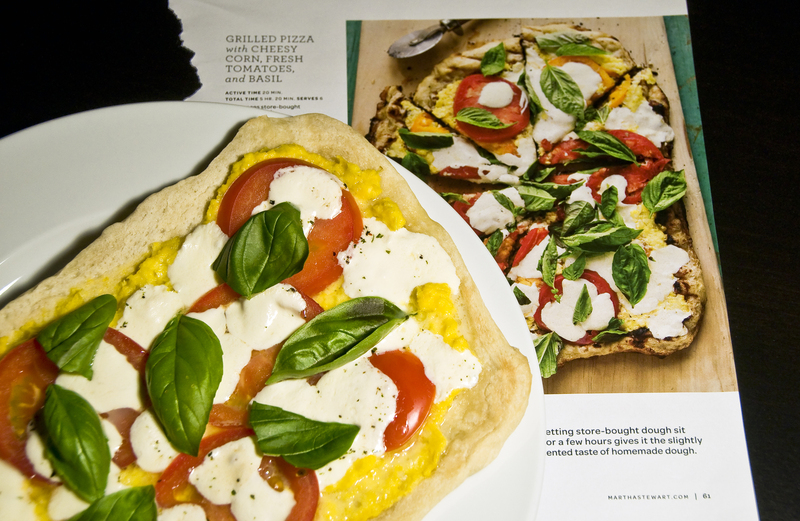 Last weekend as I was paging through this month’s volume of Martha Stewart Living I came across a delicious-sounding recipe for Grilled Pizza with Cheesy Corn, Fresh Tomatoes, and Basil. 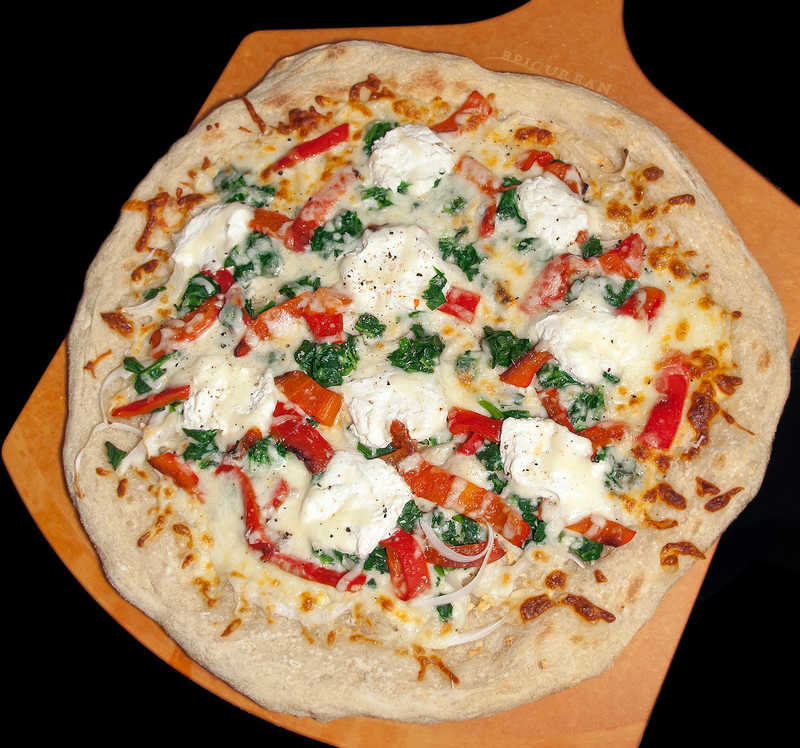 I was already planning on making pizza for dinner on Sunday and happened to have some extra frozen corn, garlic, and Parmesan, so I decided to mix up my standard Tomato-Basil-Mozzarella pizza and make this recipe instead. Since I made this on short notice I had to improvise a bit. I didn’t have any fresh corn so I used frozen corn which I rinsed and drained before blending into the relish. Although I’m sure corn freshly sliced off the cob would have been even better, I thought that the corn was pretty tasty. I also cheated by baking the pizza in the oven rather than grilling it because it was waaaay to hot out to stand over a grill (we’ve been having a major heat wave here on the east coast) ! All in all I thought the pizzas were quite yummy. Thanks, Martha Stewart! Make the corn relish by combining the corn, Parmesan, garlic, 2 tablespoons olive oil, and 1/2 teaspoon salt in a blender and blend well. Stretch the pizza dough into two pizzas and place them on a greased baking pan. (For best taste let the dough sit at room temperature for 1 hour beforehand.) Season the dough with a few pinches of coarse salt, then bake in a 425° preheated oven for 6 minutes. 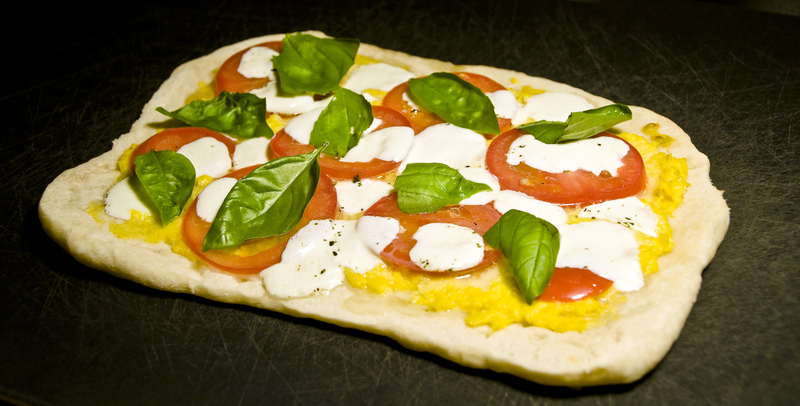 Remove from oven, flip the dough, then top with the corn relish (spread it on with a spoon), tomatoes, and mozzarella. Bake the pizzas for another 6 minutes until the mozzarella has melted. Top with the basil leaves and enjoy! 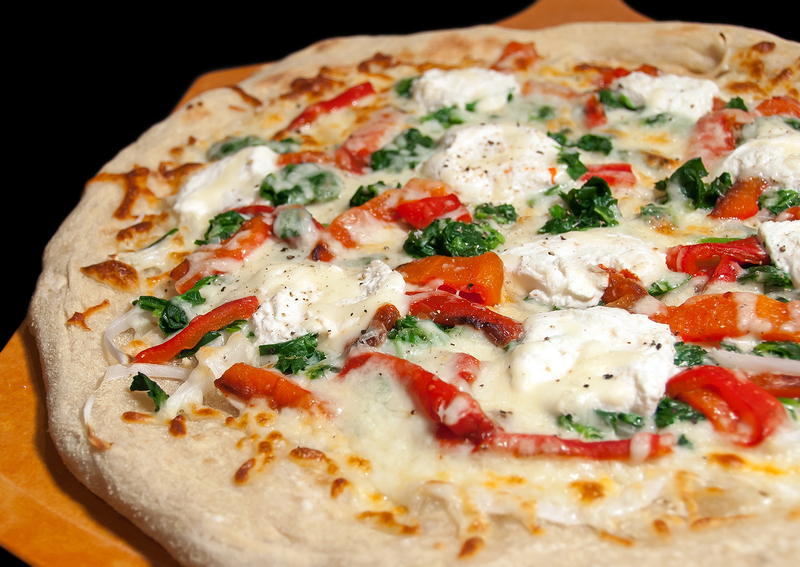 We made these delicious pizzas for dinner a few weeks ago just when the spinach in our garden was at its peak. I picked about 3 cups of baby spinach leaves (almost wiping out the whole crop but that’s ok… I was making room for pepper plants and basil!) and rinsed and dried them well before using them in this recipe. Fresh spinach leaves from the garden are juicy and bright green – very different from the bagged stuff you buy in the store! I’ll definitely be planting more spinach when the weather cools off in the Fall so we can continue to enjoy this delicious leafy green.